Flyers captain Claude Giroux celebrates after scoring against the Oilers. It was fun while it lasted, but unfortunately the Flyers' 10-game win streak came to an end Saturday when they fell to the Stars, 3-1, in Dallas. It was the team's longest streak in 31 years and helped them climb into playoff position and eventually up to third place in the Metropolitan Division. More importantly, they put some distance between themselves and teams on the outside looking it. Moreover, it was a huge confidence boost for a team that underperformed out of the gate -- not to mention what it did for the confidence of Steve Mason, who was in net for eight of the wins. In their loss to the Stars, Mason lost for the first time since Black Friday. Perhaps it goes without saying that a 10-game win streak includes more than a few highlights. But in the case of the Flyers, it wasn't one or two players that were hot. It was the entire team, with contributions coming from up and down the roster. Originally, I was going to attempt to rank the top 10 moments overall, but that would've meant leaving a whole lot of great hockey off this list. Instead, we'll go back to the start and offer up the top moments (or storyline) from each of the Flyers' 10 wins. Stolarz picked up the win in his first NHL start as the Flyers dominated the Flames, getting goals from five different players. And in the process, Stolarz made some history, becoming the first goalie from the state of New Jersey to play in the NHL. He stopped 29 shots in his debut. The Flyers surrendered a 2-0 lead in the third period of this one. Things got dark quick, even when they survived regulation to send it to overtime. A win should’ve still felt like a punch to gut, simply because of how they finished the game. Only it didn’t. Nine rounds of a shootout will tend to make you forget about what came before it. Mason was spectacular, stopping eight of the nine Bruins skaters in the shootout. He also stopped 45 of 47 shots in the game, including all six in overtime. Basically, if it wasn’t for him, the game never would’ve made it to a shootout. It might not even have made it past regulation. 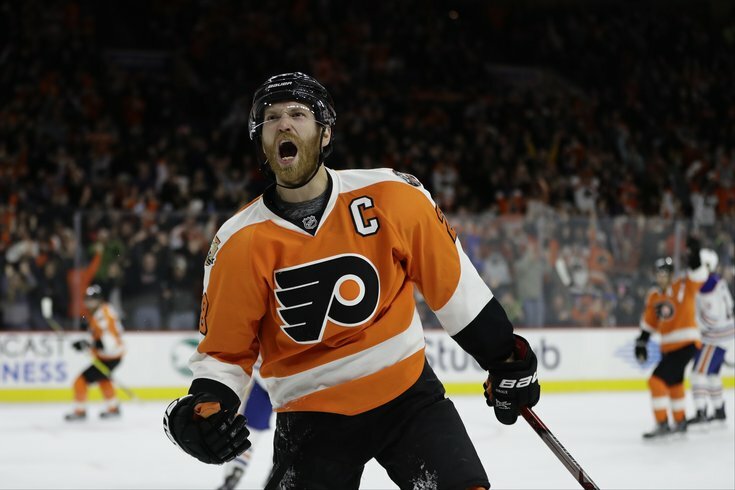 The Orange and Black overcame 2-0 deficit thanks to a pair of goals from captain Claude Giroux, including the overtime winner. WOO! Ivan Provorov delivered in the national spotlight as the rookie scored a pair and stopped another. That was the 19-year-old defenseman flexing his offensive muscles. But it was just the beginning. Two goals scored and one goal saved. The Ivan Provorov Hat Trick. There was also another great story in this one (even if it came at the expense of Corey Crawford’s appendix). When the Blackhawks goalie was taken to the hospital for an emergency appendectomy just hours before the puck was scheduled to drop, Chicago called on Bloomsburg native and former Temple Owl Eric Semborski to serve as their emergency backup, signing a one-day amateur contract with the Blackhawks. He didn’t get in the game, but he wore his Temple mask during warmups. Simmonds’ two power play goals led the Flyers past the Predators as people really start to take notice of the streak. Simmonds scored twice for the second straight game, but Voracek stole the show with game winner in final seconds of OT. I’m still not sure how he scored on that. This one also featured some drama between Brandon Manning and Connor McDavid, who hates Brandon Manning. Brayden Schenn recorded a hat trick, including the game-winning goal, as the Flyers extended their streak against the team who would end it a few games later. Steve Mason got a much-deserved night off, and the Flyers defensemen stepped up bit to help Stolarz get the shutout in his second NHL start. Schenn scored in overtime to notch the game winner … again. The Flyers weren’t at their best in this one, but were able to steal one from the Avalanche thanks to two third period goals, including the eventual game-winner, from — you guessed it — Schenn. Will a new streak start on Monday when the Flyers host the Predators?